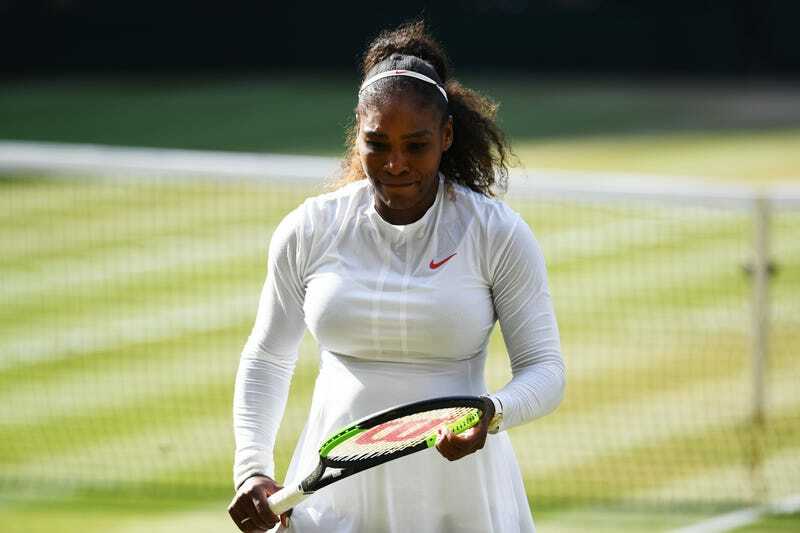 Serena Williams of the United States appears dejected during the Ladies’ Singles final against Angelique Kerber of Germany on day twelve of the Wimbledon Lawn Tennis Championships at All England Lawn Tennis and Croquet Club on July 14, 2018, in London, England. Alas, our greatest of all time is only human, and as such, lost in the ladies’ singles Wimbledon final in straight sets. Astonished German Angelique Kerber bested Williams 6-3, 6-3 on the infamous grass courts on Saturday. Williams, the strong favorite, had an A-List crew cheering her on, with her girl Duchess Meghan and Princess Kate in the Royal Box, and athletes Tiger Woods, Lewis Hamilton and Vogue editor Anna Wintour in her box to watch the stunning loss—one that denied the proud, new mama her 24th Grand Slam, which would have tied her with Margaret Court’s all-time record.. But we all know she’ll be back. “It was such an amazing tournament for me. I was really happy to get this far. It’s obviously disappointing but I have so much to look forward to,” said Williams, according to the Telegraph. “I’m just me. For all the moms out there I tried to do it for all of you. Angelique played out of her mind, and I look forward to being back,” said a gracious Williams. And even if she never steps a pinky toe on the court again, she will still have cemented herself as one the greatest. And I swear, if that jinx Drake was in the crowd, I’m going to have to beat his kekes.